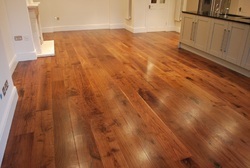 We offer Engineered Wood Flooring - Walnut to our clients. We are offering a American Walnut Wooden Flooring. We being a distinguished business company are highly dynamic in providing to the industry a vast gamut of Walnut Hardwood Wooden Floor. Inovar Floors India Pvt. Ltd.